The Yankees came into this short two game series with the Nationals reeling having lost five of their previous six games. Just the team’s luck, they then got to go up against one of the league’s hottest teams in the Washington Nationals. Continuing to frustrate, the Yankees were unable to win either of the two matchups with the Nationals. As the National League’s best and hottest hitter, Nationals OF Bryce Harper immediately made his presence felt in the series blasting a solo home run in the top of the 1st inning. The Yankees offense responded getting to Nationals starter Gio Gonzalez with a 4 spot in the 4th inning. The Yankees scored on an RBI single from Chris Young, game-tying RBI double from Chase Headley, and a 2-RBI single from Stephen Drew. In the 5th inning, Mark Teixeira took Gonzalez deep to allow the Yankees to jump out to a 6-2 lead. Unfortunately, while Gonzalez was bad for the Nats, Yankees starter Nathan Eovaldi was equally as bad lasting just 4.1 innings allowing 7 hits, 5 earned runs, 2 walks and 5 strikeouts. It was clear from the start Eovaldi wasn’t sharp and he was pulled in favor of Justin Wilson. Joe Girardi then went to David Carpenter who continued to struggle allowing a solo HR to Wilson Ramos to tie the game at 6-6 in the 6th. The score remained deadlocked at 6 thanks to a matchup of old friends, Chasen Shreve and Bryce Harper where Shreve got Harper to strikeout before turning to Dellin Betances. Betances was lights out throwing 2 innings of no-hit ball with 3 strikeouts. In the 10th inning, Brett Gardner was robbed by Denard Span of a potential lead off triple, if not more had the ball gotten by a diving Span. This game tons of momentum to the Nationals as it was a probable game-saving catch. The Yankees turned to Andrew Miller in the bottom half of the inning who obviously wasn’t on top of his game. Miller recorded both of his outs via strikeout while walking Yunel Escobar to face Ryan Zimmerman with 2 outs. On a 3-2-2 pitch, Zimmerman took Miller deep in a ball that just barely got out going off the right field pole. It was a tough loss in a hard fought game that the team should’ve won as Miller allowed his first two earned runs of the season. His ERA now sits a 0.98. Game two was just as frustrating as game one as for Yankee fans alike. Desperately hoping for a turnaround, the Yankees jumped out to a 2-run first inning thanks to an RBI double from Carlos Beltran and a SAC fly from Brian McCann. However, similar to what we saw against the Rays, that was all the scoring the Yankees offense could muster all game. The Nationals struck back in the bottom half of the first with a home run from SS Ian Desmond. Warren then allowed another solo homer to Nationals LF Tyler Moore. Warren pitched incredibly well from that point on before getting into trouble in the 7th. Ramos got on for the Nationals to lead off the inning via Chase Headley’s 9th error of the season (keep in mind he had 8 during all of last season – 6 with the Padres, 2 with the Yankees). After walking Tyler Moore, there were two on with 1 out with Warren facing Dan Uggla. Loafing and showing absolutely no effort in right field, Carlos Beltran was unable to get a glove on a routine fly ball 10 feet away from the wall. Instead of reaching his glove out, Beltran let a ball fall right beside him which, as you would expect, would come back to bite the Yankees. Uggla would walk to load the bases before Girardi turned to left-hander Justin Wilson. Warren left with a solid line of 6.1 IP, 4 H, 3 R (2 ER), 4 BB, 2 K.
With the bases loaded and one on, Denard Span slapped an RBI single just out of the reach of Didi Gregorius who was in on the grass to gun down the runner at the plate. Slade Heathcott made his MLB debut pinch running for Teixeira then moving to CF in a double-switch. A-Rod struck out looking for the second night in a row on a tough-luck, late and borderline call from the home plate umpire. The Yankees can’t catch a break as of right now as they are in a serious slump. Both of the games during this series easily could’ve been won by the Yankees had a few balls rolled their way. In a game where the Yankees own a 6-2 lead in the 5th inning, they have to find a way to close out games like this but they simply couldn’t. Additionally, the Yankees have yet to win an extra inning game this season and have had tough luck in close games. 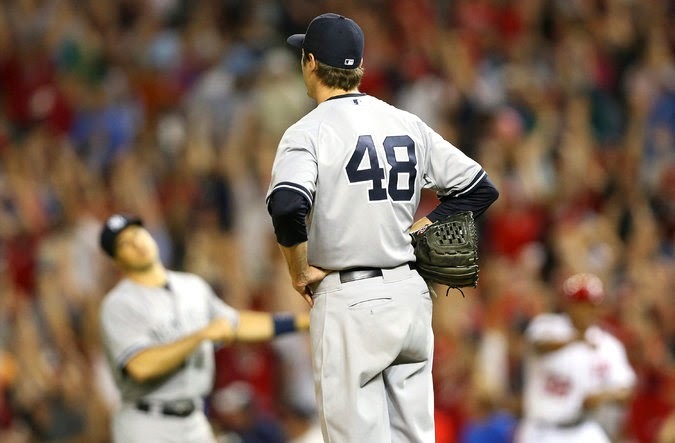 Andrew Miller –who has been perfect – was bound to allow an earned run this season, as cliché as it is. It was tough in that spot for him to be taken deep in that situation, but the fact of the matter stands: Andrew Miller has still been the best closer in baseball to this point. During game two, the Yankees certainly deserved to win that game just as much as the Nationals did, but the Nationals simply showed more fight and wanted it more than the Yankees. Beltran’s inability to catch that ball in foul territory was inexcusable. He ran a long way and then completely gave up on it when he could have simply put his glove out to catch it. Pitching in game one was bad compared to stellar in game two. Thankfully, the Yankees will have another much needed off day Thursday before beginning a 3-game weekend series with the Texas Rangers who are not a great team by any means. At 17-23, this is a great opportunity for the Yankees to take at least 2 of 3 games from the Rangers to get hot once again. We should see Michael Pineda (5-1 3.31 ERA) vs. Colby Lewis (3-2 3.06 ERA) Friday, May 23, CC Sabathia (2-5 4.67 ERA) vs. Nick Martinez (3-0 1.88 ERA) Saturday, May 24 and Chris Capuano (0-1 12.00 ERA) vs. Yovani Gallardo (3-6 4.26 ERA) Sunday, May 25. Keep in mind that the Yankees endured similar struggles to this during the first week and a half of the season before getting hot and jumping to first place. The hope is to build some momentum off of a successful weekend series against the Rangers. Follow the @BronxBomberBlog on twitter for more news, analysis, live game tweets, satire, MiLB news, and all things Yankees!